پسته از محصولات ارزشمند صادراتی ایران می‌باشد که در چند سال اخیر به علت آلوده بودن به سم آفلاتوکسین صادرات آن با مشکل مواجه شده است. با توجه به نقش مهم و تأثیرگذار پسته‌کاران در زمینه پیشگیری از تولید آفلاتوکسین در پسته، هدف این مقاله شناسایی عوامل مؤثر بر نیت پسته‌کاران در زمینه پیشگیری از تولید آفلاتوکسین بر اساس مدل اعتقاد سلامت بود. جامعه آماری این تحقیق را تعداد 330 نفر از پسته‌کاران شهرستان سیرجان در استان کرمان تشکیل دادند که 120 نفر از آن‌ها به روش نمونه‌گیری تصادفی ساده انتخاب شدند. ابزار تحقیق پرسشنامه بود که روایی آن با استفاده از پانل اعضای هیأت‌علمی و انجام اصلاحات مورد نظر آن‌ها تأیید شد. پایایی ابزار سنجش، با استفاده از پیش‌آزمون و محاسبه ضریب کرونباخ آلفا تأیید شد (92/0-70/0). نتایج تحلیل رگرسیون عوامل مؤثر بر نیت پسته‌کاران نشان داد، متغیرهای راهنمای عمل، موانع درک شده و خودکارآمدی تأثیر قابل توجهی بر نیت پسته‌کاران در خصوص پیشگیری از تولید آفلاتوکسین دارد و می‌تواند 36 درصد از واریانس نیت پسته‌کاران در مقابله با آفلاتوکسین را تبیین نماید. هم‌چنین متغیر راهنمای عمل، قوی‌ترین متغیر پیش‌بینی کننده نیت پیشگیری از تولید آفلاتوکسین بوده است. در نهایت نتایج حاصل از تحقیق می‌تواند در سیاست‌ها و برنامه ریزی‌های مرتبط با استراتژی‌های پیشگیری از تولید آفلاتوکسین در پسته بسیار مهم باشد. Pistachio is a valuable export product, but its export is faced with serious challenges due to aflatoxin. Given the importance of growers’ role in the prevention of aflatoxin in pistachio, the aim of this article is investigating pistachio growers’ intention regarding prevention of aflatoxin through the health belief model. The research population consists of 330 of pistachio growers in the Sirjan city in the Kerman province. Amongst the 330 samples, 120 of them were selected through simple random sampling. A questionnaire was the research tool and its validity of the questionnaire was approved by a panel of experts. Its reliability was confirmed by Cronbach alpha reliability coefficients (0.7 to 0.9). Also, the results of regression analysis revealed that the variables showing guide to action were the main predictor of growers’ intention. In addition to self-efficacy and perceived barriers, this variable can predict nearly 36% of the variance of pistachio growers’ intention regarding the prevention of aflatoxin. The results could be used for policy making and planning in relation to strategies to prevent the production of aflatoxin in pistachios. آزادی، ح.، خسروی پور، ب . و یزدان پناه، م. 1393. تعیین مؤلفه­های تأثیر گذار بر نیت بهره برداران در راستای ایجاد نظام زراعی – دامی مختلط در شهرستان کوهدشت. علوم ترویج و آموزش کشاورزی ایران، 10( 2): 30- 17. رهایی، س.، رضوی، س. ه. و امام جمعه، ز. 1387. بررسی توانایی گونه مخمر ساکارومایسس سرویزیه جهت کاهش آفلاتوکسین موجود در پسته. فصلنامه علوم و صنایع غذایی، 7: (1): 81-88. سبزیان ملایی، خ.، آجیلی، ع.، محمد زاده، س.، یزدان‌پناه، م. و فروزانی، م. 1394. بررسی تمایل و رفتار کشاورزان نسبت به بکارگیری مدیریت تلفیقی آفات با استفاده از تئوری توسعه یافته رفتار برنامه‌ریزی شده. مجله پژوهش‌های ترویج و آموزش کشاورزی، 8 (2): 57-70. سرمد، ز.، بازرگان، ع. و حجازی، ا. 1379. روش‌های تحقیق در علوم رفتار (چاپ سوم)، نشر آگاه، 406 ص. مرادی قهدریجانی، م. و میرابوالفتحی، م. 1386. بررسی تراکم جمعیت قارچ‌های گروه Aspergillus flavus و Aspergillus niger در ترمینال‌های مختلف فرآوری پسته استان کرمان. فصلنامه پژوهش و سازندگی، 77: 104-177. نوری، م.، و نوری‌پور، م. 1393. سازه‌های مؤثر بر پذیرش تعاون و کار گروهی در شهرستان بویراحمد: ارائه الگویی توسعه‌یافته از نظریه‌های عمل منطقی و رفتار برنامه‌ریزی شده. مجله علوم ترویج و آموزش کشاورزی ایران، 10(1): 140- 119. Armitage, C.J. and Conner, M. 2001. Efficacy of the theory of planned behavior: A meta‐analytic review. British journal of social psychology, 40 (4), 471-499. Bandura, A. 1991. Social cognitive theory of self-regulation. Organizational Behavior and Human Decision Processes, 50: 248-287. Bennett., J. W, Klich., M. Mycotoxins. 2003. Clin Microbiol Rev. 16: 497-516. Available at: http://dx.doi.org/10.1128/CMR, Visited: 2003. 3.16. PMid:12857779. Cheraghali, A.M., Yazdanpanah, H., Doraki. N., Abouhossain, G., Hassibi, M., Ali-abadi, S., Aliakbarpoor, M., Amirahmadi, M., Askarian, A., Fallah, N. Hashemi, T., Jalali, M. Kalantari, N., Khodadadi, E., Maddah, B., Mohit, R., Mohsenyd, M., Phaghihy, Z., Rahmani, A., Setoodeh, L., Soleimany, E., Zamanian, F. 2007. Incidence of aflatoxins in Iran pistachio nuts. Food and Chemical Toxicology 45(5): 812-816. Doster, M. A. and Michailides, T. J. 1995. The relationship between date of hull splitting and decay of pistachio nuts by Aspergillus species. Plant disease, 79(8): 766-769. Karen, G., Bishop, D. B. 2010. The role of behavioral science theory in development and implementation of public health interventions. Annual review of public health, 31: 399–418. doi:10.1146/annurev.publhealth.012809.103604. Hanson, J. A., and Benedict, J. A. 2002. Use of the Health Belief Model to examine older adults' food-handling behaviors. Journal of Nutrition Education and Behavior, 34: 25-30. Janz, N. K., Marshall, H., B, 1984. The Health Belief Model: A Decade Later. Health Education & Behavior, 11 (1): 1-47. Jolly, D. 1991, Differences between buyers and nonbuyers of organic produce and willingness to pay organic price premiums, Journal of Agribusiness, 9 (1): 97-111. Julinawati, S., Cawley, D., Domegan, C., Brenner, M. and Rowan, N. J. 2013. A review of the perceived barriers within the Health Belief Model on Pap smear screening as a cervical cancer prevention measure, 677-692. Kaiser, F.G., and Scheuthle, H. 2003. Two challenges to a moral extension of the theory of planned behavior: moral norms and just world beliefs in conservationism. Personality and Individual Differences, 35(5): 1033-1048. 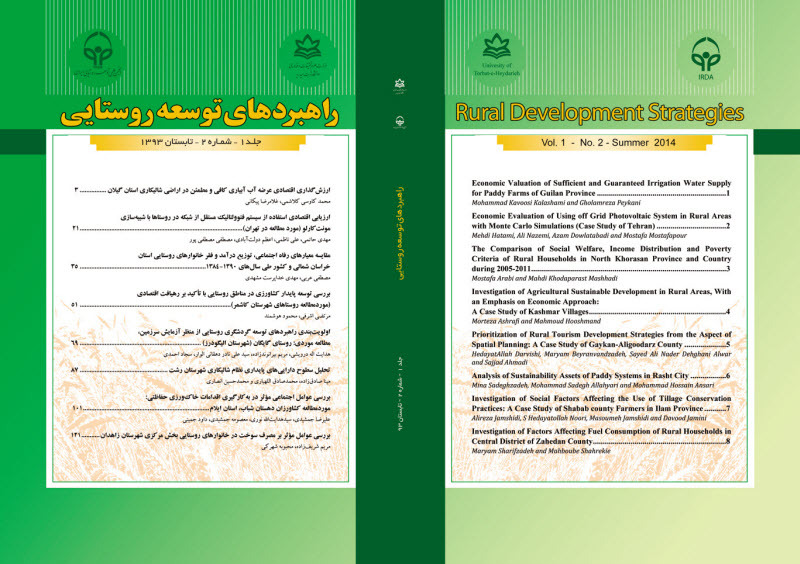 Karami-Osboo, R., Mirabolfathy, M., Kamran, R., Shetab-Boushehri, M. and Sarkari, S. 2012. Aflatoxin B1 in maize harvested over 3 years in Iran. Food Control, 23 (1): 271-274. Lajunen, T. and Räsänen, M. 2004. Can social psychological models be used to promote bicycle helmet use among teenagers? A comparison of the Health Belief Model, Theory of Planned Behavior and the Locus of Control. Journal of safety research, 35(1): 115-123. Milne, S., Sheeran, P. and Orbell, S. 2000. Prediction and intervention in health related behavior: A metaanalytic review of protection motivation theory. Journal of Applied Social Psychology, 30(1): 106-143. Moghadam, M. M. and Hokmabadi, H. 2010. Study on the Effect of Pistachio Testa on the Reduction of'Aspergillus flavus' Growth and Aflatoxin B1 Production in Kernels of Different Pistachio Cultivars, ‏744-749. Moghaddam, M. M., Goltapeh, E. M., Hokmabadi, H., Haghdel, M. and Mortazavi, A. M. 2006. Evaluation of susceptibility of pistachio cultivars to aflatoxigenic Aspergillus flavus and aflatoxin B1 production. Acta horticulturae, 655-658. Saremi, H. and Okhovat, M. 2008. Effect of aflatoxin produced by Aspergillus flavus in reduction of our pistachio marketing all over the world,‏ 9-15. Rahimi, P., Sharifnabi, B. and Bahar, M. 2008. Detection of aflatoxin in Aspergillus species isolated from pistachio in Iran. Journal of phytopathology, 156(1): 15-20. ‏Wier, M. and Calverley, C. 2002. Market potential for organic foods in Europe. British Food Journal, 104(1), 45-62. Windigni, G., Janssen, M.A. and Wander, J. 2002. Organic food consumption. A multitheoretical framework of consumer decision-making, British Food Journal, 104 ( 8): 624-42. Yazdanpanah, M., Forouzani, M., and Hojjati, M. (2015a). Willingness of Iranian young adults to eat organic foods: Application of the health belief model. Food Quality and Preference, 41: 75-83. Yazdanpanah, M., Hayati, D., Thompson, M., Zamani, G. H. and Monfared, N. 2014. Policy and plural responsiveness: Taking constructive account of the ways in which Iranian farmers think about and behave in relation to water. Journal of Hydrology, 514: 347-357. Yazdanpanah, M., Komendantova, N., Shirazi, Z. N. and Bayer, J. L. B. 2015b. Green or in between? Examining youth perceptions of renewable energy in Iran. Energy Research & Social Science, 8: 78-85.